Progress with the rebuild of our Britannia G-ANCF has been slow during the past year, mainly due to lack of funds. It has been very noticeable that the number of donations from individuals has all but dried up, I am sure as I result of the current economic climate. We are however pursuing other revenue sources including grants. For the first time last winter, the aircraft fuselage was basically water tight and suffered very little water ingestion. Because of the early heavy snow we decided not to work on the aircraft during the winter months so were pleasantly surprised to find the cabin and cockpit area dry when we returned to the aircraft in early March. During the summer months, students from Macclesfield College paid several visits to work on the aircraft mainly concentrating on the tailplane restoration. Half of this has now been cleaned, treated for corrosion and repainted. The other half will be completed next summer ready for fitting to the aircraft. Other work undertaken during the summer included removing the old wiring and sound proofing in the cockpit area in preparation for refitting the instrument panels. This will be worked on during the winter months. The two main undercarriages were moved to Oxford in June to be overhauled there but sadly due to other commitments, the company doing the work have now said they are unable to do the work required, so we are looking for alternative organisations to help us. Watch this space !! We have now decided to replace the wooden trestles which have served us well over the years, with purpose built metal ones. These will be higher than the current ones in order to have the aircraft at the height it would be when on its undercarriages. The idea being that it would be easier and safer to fit the undercarriages from this position rather that have the aircraft dangling from a crane. In July we hosted a group who were interested in seeing the restoration project and visiting the old art deco terminal building at Speke. A good day was had by all along with some much needed donations. A big thank you to the Crown Plaza Hotel for there help. Northbrook College have manufactured some new door runners which will be used to get the rear passenger door back in working order and our dismantled propeller was delivered to Speke from Kemble in early October. We have increased the number of working volunteers in recent months and plan a minimum of one volunteers working day each month during the winter and are currently in discussion with the Macclesfield College regarding regular working days for their students through to next June. Please send any donations, large or small to the BAPT at 12 Northway, Lewes, Sussex BN7 1DS, or purchase some of our hand made Christmas Cards and Calendars. 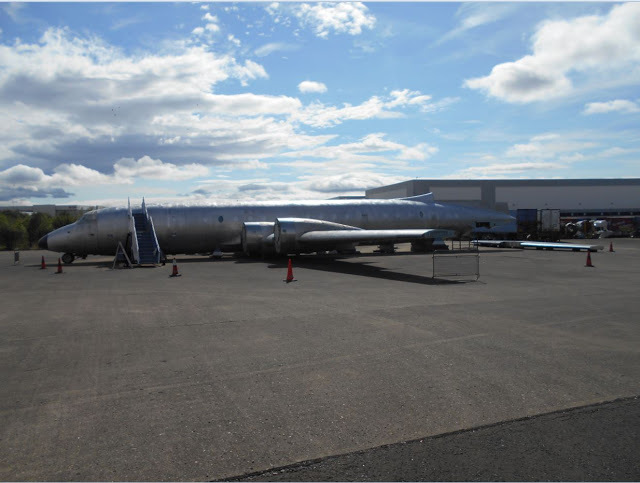 The refurbishment of G-ALRX being undertaken by volunteers from the Bristol Aero Collection has progressed well over the last year. The rear bulkhead being replaced, installation of a DVD player in the cabin along with various improvements in the cockpit and cabin area.